I’ve probably been to about $500,000 worth of seminars in my life. And I haven’t paid for a single one. I’ve been so blessed to be in seminar rooms with some of the world leaders in the area of a Business, Personal Development and Finance. Usually as a part of the AV staff and sometimes, I just knew the right people. I taught myself everything I know and I’ve never made a significant financial investment in my education. I took myself out of Private school when I was about 15 because of the financial guilt my mother put on me. At the time, she said that if I were to go to public school (at no cost), she would buy me a Fender Stratocaster – which as a teen guitarist, was really all I wanted in life. When I spend money, it’s really important for me to get something tangible. This is why I have trouble talking with marketers when I meet them. If they tell me they’re amazing, I really want to believe them. But without them spending hours explaining their sales funnels or showing me their PayPal activity, it’s kind of tough. I love that when people need to stalk me or check out my quality of work, they can see any one of my client’s websites or videos and judge me accordingly. Although, they are only seeing the tip of the iceberg and they don’t get to see the sales funnels or software integrations, it’s at least a start – and you know quality when you see it. 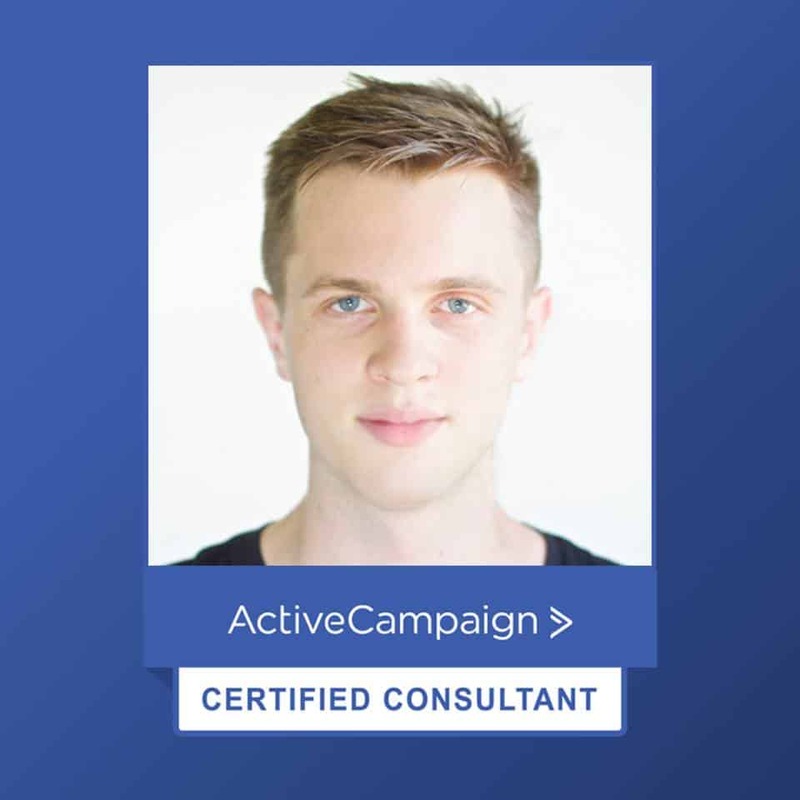 I had been using ActiveCampaign for about a year when I received an email from Brian Gladu, the head of marketing at this brilliant company. Brian let myself (and I’m sure a handful of other people) know that they were about to open the doors for their first set of ActiveCampaign Certified Consultants. We started a brilliant back and forth with me being resistant to the more than affordable price tag of the certification training. He let me know that my main benefit in becoming a consultant was that I also had design and development skills. Long story short … I signed up… And I’m so glad I did. I love this platform and I love this company. It checks every box for what an amazing CRM should be. With my clients, I’ve bounced around everything from iContact, Aweber, Constant Contact, Ontraport, MailChimp and even… INFUSIONSOFT. All of these platforms (besides MailChimp) left me with a terrible feeling. I could understand how myself or my clients were paying hundreds of dollars every month for a sub-par product. I will gladly challenge anyone that wants to tell or demonstrate to me that Infusionsoft is better than ActiveCampaign. To me, Infusionsoft spends more money on it’s marketing than it does on it’s product development. The only reason they rose to fame is because guys like Frank Kern positioned it that way. The only reason people would continue to spend their money with Infusionsoft is because they already have their systems and funnels in place and it would be more of a hassle to recreate them all in another platform. When I use an amazing product or platform, the first thing that stand out to me is the design. I believe that good design conveys a message of caring. Whether it’s a mobile app, website or a flyer, good design sends a huge message to the viewer. When I find poorly designed websites, it takes a lot for me to even give the vendor a chance to convince me that they would be good to do business with. Of course, I’ve been fooled before. Good design really matters. It’s a mental struggle for me to see people making millions of dollars when their brand, website or products look crap. It really makes me question a lot and turns me into a cynical mess. A blog post for another time. When one of my business partners Christal Fuentes of The Ladies Coach and I moved from MailChimp to Ontraport, we had all the high hopes that they had sold to us by examining their website, but when we finally got access to the application, it was less than exciting. The website builder was terrible and the whole experiences was just awful. It blows my mind that people can still build so much hype around a crap product. I don’t know if it’s obliviousness to what may be better or that feeling where you’ve spent $100 on a pair of shoes that are one size too small but you wear them anyway because of the financial investment… and you tell people you love them. As I write this, I keep getting distract by the distaste I have for these other companies, so I’ll try to focus on why I wanted to write this in the first place. Did I mention ActiveCampaign is amazing? As time goes on, I’ll try to share specific features that make it amazing, but for now, I’ll answer the question that the title of this blog post asks. Because I want to grow with this company. It wasn’t because I need more clients. It wasn’t because I needed the credibility (although I do enjoy it) and it wasn’t because I needed a training session in the platform. I wanted to be at the forefront of this companies growth as a #1 supporter with season tickets to every game. An artist is truly at their best when they have the right tools. That’s how I feel when I use this platform. There’s not a lot that I can’t do with it. With the level of integrations that it supports, the possibilities are truly endless. In fact, to really test this, I created a mobile app for my client, Jamie Greene. I didn’t actually code it, but I did design every pixel of it. If you find yourself needing some help with ActiveCampaign – just shoot me an email, I’d love to see what you’ve got going on. This thing has a seamless integration with WordPress, Facebook (for login) and ActiveCampaign. Details are cross checked with all platforms and I’m applying tags to the user’s record in ActiveCampaign as they use different features of the app. Including requesting access to upper level programs. With AC’s developer friendly API, my iOS Developer (a 16 year old kid from Pennsylvania) was able to create and integrate this in no time based off my designs. Do you have any experience with SalesForce Pardot? Could you compare it to ActiveCampaign? Thanks for finding this post. I can’t say that I’ve ever used it. Although, looking at the pricing, it’s SOOOOOO far out of reach for the every day Entrepreneur. $1000 / month is what some people pay for rent. I bet there’s nothing that Pardot does that the $9/month ActiveCampaign account couldn’t do. What to you think? Seems like it’s your weapon of choice. ??? ?